My trip to Puerto Rico started as a leisure adventure, but unknown to my parents and my girlfriend. I had an ulterior motive which was to chase the silver king, Megalops atlanticus, Tarpon is one of the most explosive game fish to cruise the ocean. I was about to have a shot on the fly. With much research, I had a guide booked out of Cangrejos Yacht Club in Carolina, Puerto Rico,just outside San juan, for 5:30 am the following day. So as our plane had landed, I looked out the window over my girlfriend’s shoulder. I was filled with excitement ready to get this adventure or “family vacation” on its way. Not a wink of sleep my eyes pop open, gear In hand I was out to the concierge to hail a cab to the yacht club. This is where I meet Capt. 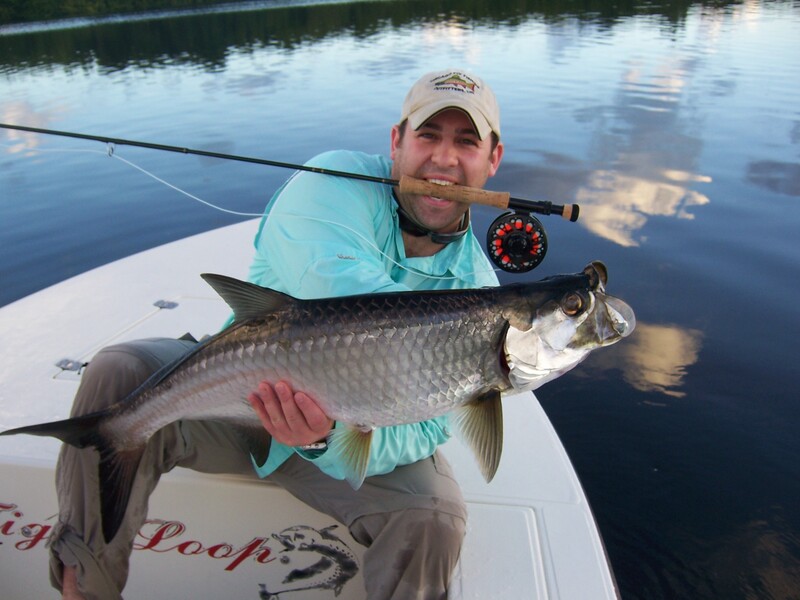 Nico Guzman, one of the few fly angler guides on the island who chase Tarpon. As we began to cruise thru tarpon town, I had visions in my head about how this was about to go down, explosive jumps, bird nests of line all over the place, long fights & worse lost fish. I figured at the last minute I’d choke and lose what ever was at the end of my line. Not getting the chance to bow to the king. Rumors of some of the best fly fisherman I know hooking up and landing none had me thinking, I had no chance. But, what is life on the fly about, so I took my chances. Little did I know hard work would pay off, but didn’t know how or when? The hunt for the silver king was on its way deep into the brackish lagoons of Puerto Rico. Before the sun even broke I was at my first ever chance to cast to a tarpon. Under the lights near a channel, not casting my 10wt in about 3 months I had a real eye opener with fouled line and a mess on the deck. We decided to move on to an area were at sunrise the tide resides, and sure enough the Tarpon start to roll and come up for air. You can anticipate your next cast much, because it’s like a toilet flushing out there you hear the sound but by the time you look you just see a ripple. After several blind casts, we took a break to head in the lagoons a bit to try and out smart this elusive game fish. Again I find my self on a still patch of water, with birds circling above in hopes of bait fish, I hear that haunting sound. So I hear cast 2 o’clock, I let this double haul stroke out. What seems to be a truck on the other end, I had hooked up, and the battle had begun. Setting the hook was a skill in its own, making sure this salt water hook was set deep into the Tarpons jaw. Then it happened, like a lunar eclipse he had rose to the occasion, and I didn’t bow much less even know how to react. In a flash he was off the leader with my fly and on its way to out smart another novice angler. I thought that was it, my shot had come and gone, Capt. Nico shouted 10 o’clock, I had let another powerful cast out of my rod tip to fall short of were need be. Re-setting up my shot I had changed directions to my own call at 1’oclock. I let it rip and striping my line like it was on fire I had my second hook up. I had slowed down a little trying not to mess this one up, the Tarpon went up and I bowed liked it was royalty. Three times he went up and winked back, saying you want it come and get it. With the title of a fly angler, meaning while fighting a fish applying counter angles to your rod in order to land a fish. I had a fight that I think now 4 months later my arms and wrists still ache. I’m sure it’s just from all my fly tying, I’ve been doing but again it was a test of skill and strength for me to land this fish. It felt like a soggy bed at the end of my leader, and it wanted nothing to do with my “angles”. I had better control of my destiny then this fish; he had his way with me, until he tired out and played dead. Just as I had him in my sight, he was up again and parallel with the water about 15ft from the boat. Staring at me with his silver and black body he was gone out of sight and shaking the rod tip, which was my only way to know he was still there. This brought many great thoughts and emotions about living life on the fly, not knowing what was in store for me as a fly angler.